The delegation revealed new evidence of the involvement of European institutions in financing palm oil grown on illegally deforested lands and highlighted accounts of human and environmental rights violations compiled by the Forest Peoples Programme (FPP) and the Environmental Investigation Agency, both UK-based NGOs. Palm oil is used in thousands of products, from peanut butter and ice cream to household cleaning products, toothpaste, and shampoo. 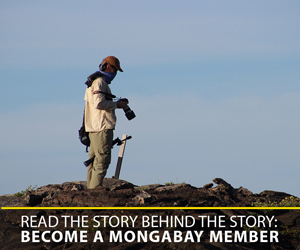 It is also one of the leading drivers of illegal tropical deforestation and social conflict. A disproportionate amount of so-called “conflict palm oil” is destined for the European Union, research has shown. 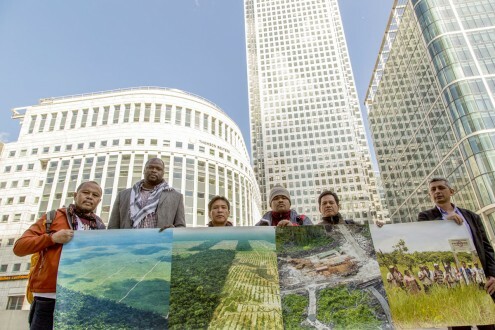 An international delegation of leaders from indigenous and forest communities in Colombia, Indonesia, Liberia, and Peru are in London to call for action on human rights violations and land grabbing linked to the global trade in palm oil. At a press conference held today, the delegation revealed new evidence of the involvement of European institutions in financing palm oil grown on illegally deforested lands and highlighted accounts of human and environmental rights violations compiled by the Forest Peoples Programme (FPP) and the Environmental Investigation Agency, both UK-based NGOs. Indonesia and Malaysia have led the world in the production of illegal palm oil for decades, but palm oil growers are increasingly seeking to expand their operations to countries in West Africa and Latin America. Critics of the palm oil industry say that trend has unleashed a new wave of human rights violations and environmental destruction in those countries. A disproportionate amount of so-called “conflict palm oil” is destined for the European Union, research has shown. A report released last year by the Brussels-based NGO Fern found that 18 percent of all palm produced from illegal tropical forest destruction ends up in the EU. France, Germany, Italy, the Netherlands, and the UK are by far the biggest consumers of commodities produced outside of the law. The London press conference was the culmination of a 10-day EU tour in which the delegation first attended meetings of the European Parliament and the European Commission in Belgium before traveling to the Netherlands, Germany, and the UK to urge government and private sector decision-makers to account for human rights and the rights of indigenous peoples while crafting measures to make the production of palm oil sustainable. Indigenous and community leaders Franky Samperante (Indonesia), Ali Kaba (Liberia), Sedequías Ancon Chávez (Peru), Agus Sutomo (Indonesia), Robert Guimaraes Vasquez (Peru), and Willian Aljure (Colombia) in London to raise awareness about the impacts of London-based companies and financial institutions involved in palm oil supply chain violating indigenous and human rights. Photo by Kinsgley Uzondu / Forest Peoples Programme. In particular, they are calling for the EU and its member states to strengthen regulation of financial and corporate institutions involved in the agribusiness sector to ensure compliance with national and international human rights and environmental protection laws. One specific demand was that financial regulatory bodies remove United Cacao Ltd SEZC from trading on the London Stock Exchange due to the reported illegal deforestation of 11,100 hectares (nearly 27,500 acres) and related rights violations in the Peruvian Amazon. “We are demanding that the London Stock Exchange immediately halt trading services and cancel registration of companies that act outside of the law,” Robert Guimaraes Vasquez, a member of the Shipibo-Conibo indigenous people of the Peruvian Amazon, said in a statement. The tour comes just two months after the world’s largest sovereign wealth fund, Norway’s Government Pension Fund Global, adopted a human rights policy requiring all companies in which the fund invests to respect human rights, integrate a human rights strategy and risk management into their operations, and report on their performance in a comprehensive and transparent manner. Certification schemes like the Roundtable on Sustainable Palm Oil (RSPO) can sometimes be useful to communities that find themselves in conflict with palm oil companies, as they frequently provide the only means of challenging destructive plantation development and other corporate abuses. But the delegates said that, in order to be more effective, certification complaints systems like the RSPO’s must be strengthened and better equipped to respond to and investigate community complaints. Testimonies from communities on the ground, they added, demonstrate that green labelling and voluntary approaches are not providing adequate redress for forest communities’ grievances. 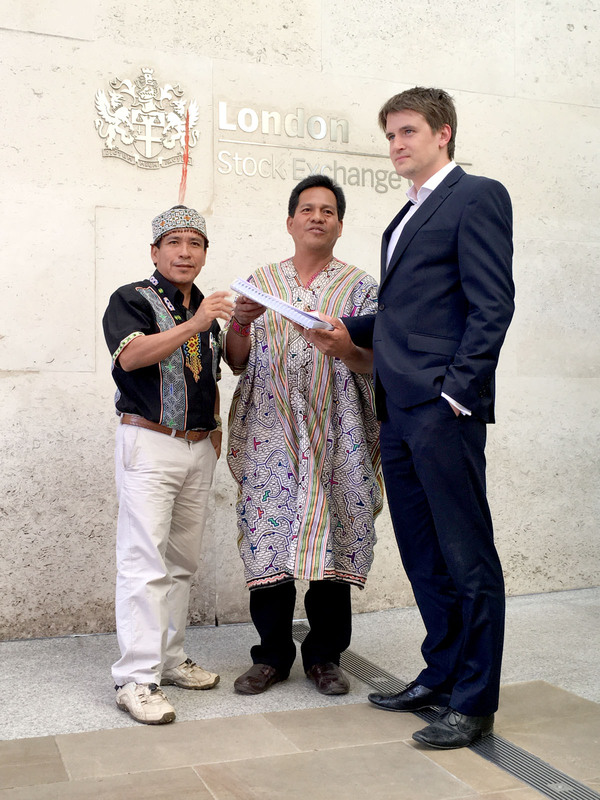 Indigenous leaders Sedequias Ancon Chávez of AIDESEP (left) and Robert Guimáraes Vásquez, a member of the Shipibo-Conibo indigenous people from Peru’s Amazon (middle), submit a formal complaint to the London Stock Exchange regarding rights violations by an AIM-listed company. Photo by Kinsgley Uzondu / Forest Peoples Programme. A number of players in the palm oil industry have adopted voluntary forest conservation policies. But despite these commitments, 2015 was a bad year for Southeast Asia’s forests. Fires in Indonesia exacerbated by the drying of peatlands caused by deforestation for the production of palm oil raged across more than two million hectares (nearly 5 million acres) of forest and released more pollution than the United States in the months of September and October, when the fires were at their peak. The delegates said that Wilmar International, which controls some 45 percent of global trade in palm oil and is widely regarded as having begun the movement among palm oil companies to adopt voluntary “No deforestation, no peat, no exploitation” commitments, is a good example of why government intervention is needed to ensure compliance with the law. Independent NGOs continue to find that major suppliers to Wilmar, such as Bumitama and Kencana Agri, are clearing forests and abusing community rights. Samperante added that the uncontrolled expansion of palm oil plantations is directly responsible for creating land rights conflicts. Just as important as new regulations on the global palm oil supply chain is legal title to traditional lands, the delegation pointed out. A Woods Hole Research Center analysis last year found that indigenous territories in the Amazon Basin, the Mesoamerican region, the Democratic Republic of Congo, and Indonesia contain more than 20 percent of the carbon stored aboveground in Earth’s tropical forests. In other words, giving indigenous communities legal title to their lands would not only help head off conflicts with producers of palm oil and other global commodities, but could help prevent runaway climate change, given that forest communities have been known to not only conserve but actually enhance the carbon storage potential of forests. “Since much of the global demand for palm oil-based commodities is being driven by EU consumption, we need strong binding regulations of supply chains bringing palm oil and other agricultural commodities to Europe, not voluntary schemes,” Ali Kaba, program coordinator and senior researcher at Liberia’s Sustainable Development Institute, said in a statement.